While removing my broken Jeffa autopilot see http://www.myhanse.com/jeffa-autopilot-failure_topic10801.html I noted a green ground wire attached the top of my aluminum rudder post, just under the quadrant. Jeffa reports that their rudders should not be tied into the 505’s grounding system. It appears my rudder is tied in. My 505 was delivered in May 2016 and I was quite surprised to see this given all the prior information on this. I’m trying to confirm this with the factory but I suspect it may be another build error. Any news from tbe factory on the ground wire. If the ground wire is connected to the electrical system of the boat, than i would remove this connection. Hi there should be posts on this from about 2014 when I raised the same issue. As the boat was still under warranty I was reluctant to remove this without Hanse formally agreeing that it was the right thing to do. 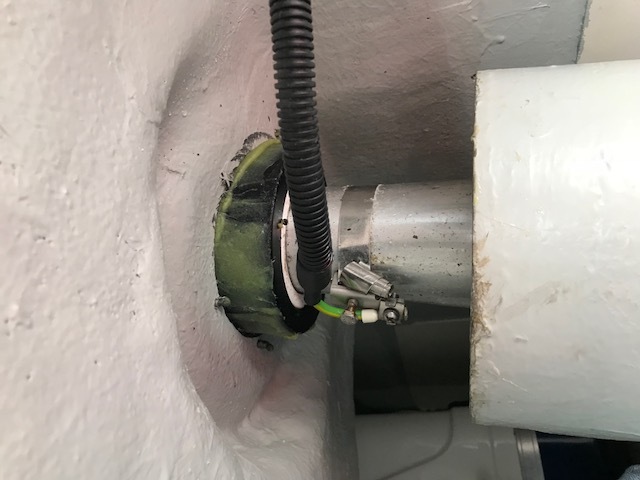 was installed correctly and should remain in place. I’d check with the factory on your boat. I would ask the question to Jeffa NOT to Hanse. Jeffa has their act together a heck of a lot better than Hanse does. Electrolysis can only happen if there is the ability to have current to flow which is exactly what the wire provides and it should be removed. "Regarding grounding of your rudder stock we strongly recommend that you remove it. It only increases the risk of corrosion"
I agree with Peter-Blake, if the rudder is connected to hull anode only and not the rest of the boats wiring system then this is the best solution. Don't assume that an isolated rudder will remain isolated forever (dirty bridges, autopilot shorts, worn autopilot bushes etc etc). I posted an article some time back about removing the factory connection between 12v negative buzz and shore-power earth buzz thats worth reading. As I recall, my dealer confirmed that the rudder post has its own anode, separate from the rest of the system, as delivered by the factory. I’m not sure when Hanse started doing this. My boat was delivered from the factory in early 2016. Rubato, will check this set up with Jeffa, as you suggest, and report back their response.